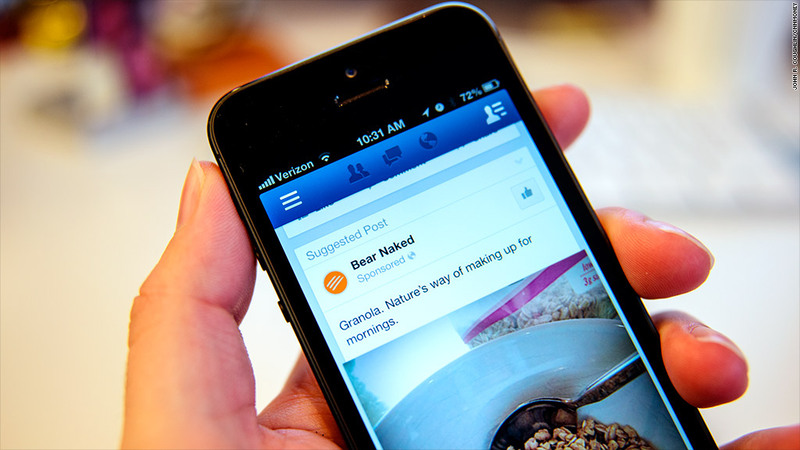 One year after launching mobile ads, Facebook is expected to triple its market share in 2013. Remember when Facebook admitted it wasn't making a penny off its mobile users? Just one year after finally launching mobile ads, the company is on track to capture nearly 16% of the market in 2013. That's triple the global mobile ad market share Facebook controlled last year, according to eMarketer, a firm that publishes research on digital marketing. In a report published Wednesday, eMarketer said Facebook is taking the market by storm and far outperforming the firm's earlier estimates. Facebook's accomplishment is even more striking when taking into account that the social network's mobile ads raked in exactly $0 in 2011 -- that is, they didn't exist. Facebook admitted shortly after its May 2012 initial public offering that it wasn't making "any meaningful revenue" from mobile. The company didn't start showing mobile ads until August 2012. What a difference that year has made. Facebook (FB) stock was in the toilet for months after its IPO, plunging below $18, weighed down by investors' concerns about the missed mobile opportunity. But shares have more than doubled since Facebook introduced mobile ads a year ago. Facebook also debuted other new mobile products, including a more visual news feed, a Facebook Home startup screen for Android phones and a test program for one-click mobile shopping checkout. Those efforts have paid off, with Facebook reporting in May that mobile accounted for 41% of the company's total ad revenue in the second quarter. Facebook shares are finally above their $38 IPO price, nearing $42 earlier this week. But Facebook still faces some obstacles for future growth. Mobile ad revenue can't keep growing at such a rapid clip forever, so the company will need to find a way to continue innovating and to keep investors satisfied. Meanwhile, Facebook is still far outmatched in global mobile ad market share by No .1 Google (GOOG). EMarketer expects Google will notch a 53.2% share of the market in 2013. Facebook also has plenty of room to grow in the overall digital ad market, which combines mobile with desktops and laptops. EMarketer expects Google to control newarly a third of the digital ad market in 2013, while Facebook is slated for a 5.4% share. Yahoo (YHOO), despite CEO Marissa Mayer's focus on mobile, is expected to be a distant third with less than 3% of the digital ad market this year.